What did you love best about Tendrils of Life? 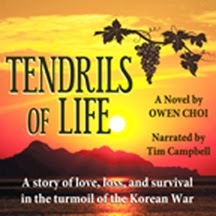 Choi makes the reader care for Jimin and his family, but also understand the actions and motivations of his adversaries. What appears to be a classic family feud between the Barks and the Barns unravels to be a far more complex tale of human fallibility. 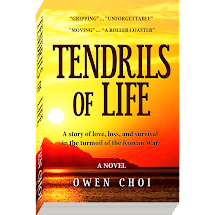 There are no fairytale endings here, but Choi leads the reader through the sorrow to a place of hope. Campbell's performance was masterful. He easily navigated any pronunciation difficulties with Korean names and language. His characterization was very natural and engaging -- making me forget that this was just one person dramatizing the story and numerous voices.